This is an article about Death Tracker. Hold on to your seats, because this time we’ve got something absolutely fantastic for you. The Death Tracker is a powerful tool which gives you the ability to track deaths of all players on a specific server. This real-time operating system monitors the database with just a short delay, and then sends visual and verbal notifications within approximately 2 minutes after a given player’s death. Our unique tool gives you countless possibilities of usage. I will present some of them later on. A simple dropdown list allows you choose the specific server on which you can track deaths. You can adjust the tool’s settings by clicking on “Click Here to Display/Hide Options”. Here you can filter all the notifications and decide what you will be notified about. The options are self-explanatory. For example, ticking options “Skip warnings for Dawnport/Rookgaard” and “Skip warnings for monster arena deaths” will help to avoid the unnecessary death spam; ticking “Track only Rare Bosses” is the option for the players interested solely in bosshunting, etc. The built-in voice alert system is a great advantage, as you don’t even need to look at the tool’s operating screen. You just need to have it opened and minimized in order to be notified about every death you want. You can also disable the voice alerts and just choose the “Enable sound effects” option instead – you will hear a short sound every time someone dies. Of course, both options can be chosen simultaneously. It indicates the body’s stage of decomposition. It’s very important, as the body can be opened and identified only in the first 2 stages. If you want to reclaim the loot, it must be done before the body turns into skeleton. You have one real-time hour to do so. Moreover, there is an additional message that refreshes automatically – e.g. “This body will turn into a skeleton in 2 minutes“. Please remember that the players’ database is huge and that the list of online players on tibia.com gets updated every 5 minutes. It may happen that the tool will skip some deaths and acknowledge them after more than 1-3 minutes. There will be a sound notification played in such situations. Last, but not least, the tool can be used and is running smoothly on smartphones too. Both casual and professional bosshunters can take a special advantage of our tool. Any player killed by a boss is marked with Rare Boss!!! description. You can use the “Track only Rare Bosses.” filter in the display menu. This way, you will be notified only about the deaths caused by bosses. All you have to do then, is quickly figure out the location of the boss and the player who has been killed, and of course get there fast to kill the monster and to possibly loot the unfortunate boss’ victim. What is more, even if you are not going to hunt the boss or simply missed it, you don’t have to check it anymore this day. The time is being saved and time is money. And so on. Keep in mind that these are just the examples of bosses which may be tracked more often than others. Pretty much every boss can get tracked by the tool, it’s just a matter of the possibility of player’s death due to given boss. If someone uses noobchars to check the bosses – here is your chance. You may be quicker if his noobchar died and he’s relogging on the main char. Here is Flamecaller Zazrak killed by Makadamia, just after someone got killed by him on Muggy Plains. As you can see, you may even track PoI bosses with the Death Tracker! So fellow bosshunters, keep the Death Tracker open. Don’t miss the chance and enhance your bosshunting experience ! Tibiabosses gives you a brand new subvocation – corpse hunters! Just wait for our tool to track a dead player, figure out where did he die and RUN! Decide yourself if you wanna keep the loot or give it back, it’s hell of fun, believe me. ? We do not encourage you to steal the backpacks and eq, you can as well just take a screenshot and give the loot back to the rightful owner – you know just like you would catch the fish and let it go back to the water. Giving items back may get you many friends and gratitude overall, which is also priceless. This loot below is hella nice, but make sure to read the whole article. The best one will be at the end. Let me explain it further and give you some important hints. 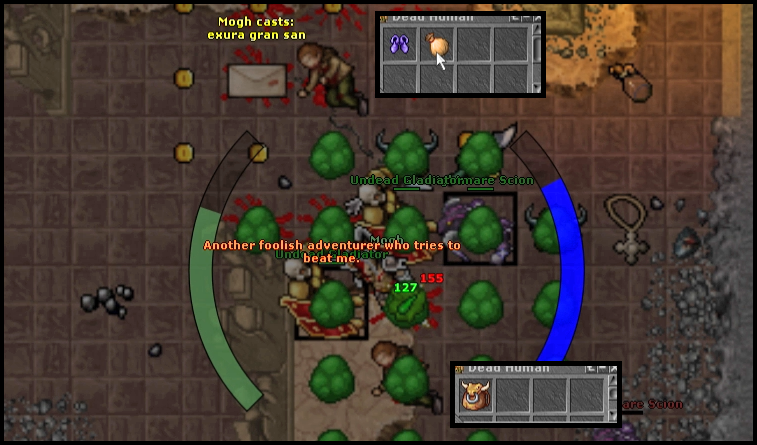 It’s good to look quickly at the killed player’s profile on tibia.com (you can use the hyperlink in the tool). Check if there are any deaths that may be related to the newest death shown by the tool – it can help you to find the body. Take the player’s level and home town into consideration, too. For example: free account player from Venore dies by the valkyrie. Most likely his body is somewhere in the amazon camp north-west of Venore, rather than in the camp north of Carlin. 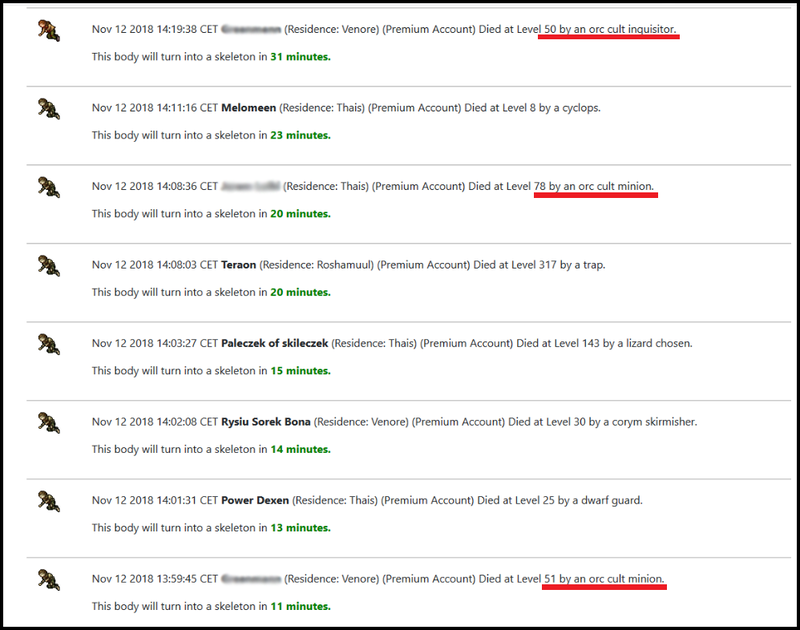 Another example: premium acc player, lvl 60 dies by the ancient scarab. I would start checking in the Mother of Scarabs lair, as it’s the biggest and most popular resp of ancient scarabs nowadays. You have to turn into a detective for a while, some deaths are obvious, some are really tricky. on the desert north of Ankrahmun. 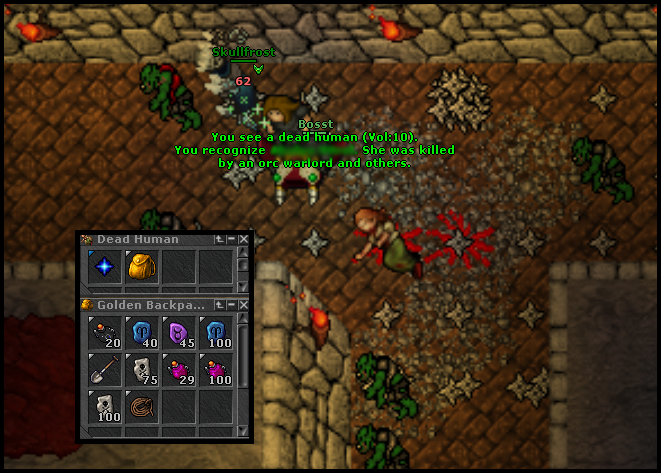 If the tracker shows that someone died 2 times in a short time, then there is 99% chance that he lost his eq/backpack and tries to get it back. If you notice situation like this then the player’s level doesn’t really matter. The players who lost their items usually panic and run for them even without any potions/runes. It may be worthwile and very profitable to look for the body. Take a look at the screenshot below and analyze the case. This is an ideal case. 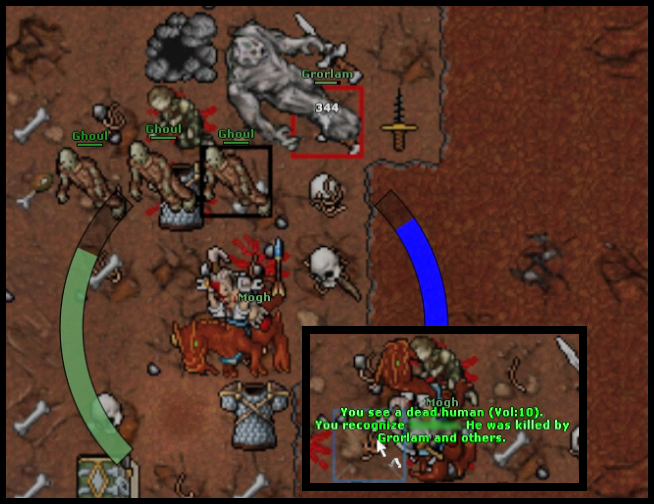 2 guys were hunting orc cults and died. Both lost their items. The lower level tried to get them back but died for the second time. Results? Not bad, there were also quite a lot of manas and runes in the backpacks. And the golden legs are always nice. ? One final hint. Observe the environment while looking for the bodies. 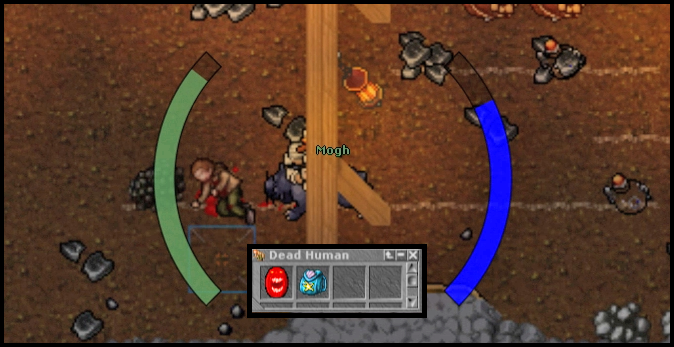 Shovel holes which have been opened not long ago, fresh corpses of monsters, blood stains on the floor, even other players just running around and not killing anything. Each one of these might be important and can possibly help you to find the right place and get there as fast as possible. Let me warn you. Doesn’t matter if you are playing on pvp or optional pvp server. Corpse hunting may get you in trouble, it may get you hunted, hated and so on. If you have ever played on a pvp server then you ‘ve probably seen that many players, after being killed by pk, write their nicks and location on public chats. This is for the so called “pk policemen” who track and hunt them down before the skull and PZ lock goes off. No more tracking the chats and asking the pk victims for more details! Open the Death Tracker and let the bodies of players’ killers hit the floor – now it’s easier than ever! Whether you are neutral or not, it might be good to know where the current battle takes place. Our tool can help you with that. If the Death Trackers notifies you of many pvp deaths in a short timespan, then you can be sure that there is a nice battle going on somewhere. Exiva the parties to join them or to get the info which places should be avoided for the time being. There is a killing trick on pvp servers and it’s called “bless trap”. You just block the way to the temple (in Kazordoon for example) and wait until someone comes to buy the blessing. You are sure then, that the player is not protected by the full blessing set and may drop something upon death. With the Death Tracker you can set the bless trap anytime you notice that someone has just died and got tracked by the tool. You should have at least a few minutes to prepare. This can be especially efficient when a group of players get killed and all of them are buying blesses at the same time. Death Tracker shows how much time is left until the killer loses his pz lock. Note that it is for infomational purposes only. There is no way to check if the player is marked with the skull and which type of skull it can be. Who is hunting the Plague seal/Falcon Bastion/Library etc. Who is hunting/luring on Roshamuul. Who is rooking his char at the moment/got hacked. If Gaz’Haragoth is being killed right now. Where are your enemies hunting in general (on optional pvp servers where you can’t just use exiva). Who is using arena monsters to teleport to specific hometown (Roshamuul especially). Also, it might be a little creepy, but if someone just died you can ask if his hunting spot is free. (Yes, we have tested it :D) So you may even use our tool as a Free Hunting Spots Finder! Look at the example below. Player most likely died only to teleport himself to Roshamuul. Enough talking, we hope that you will enjoy the tool as much as we did during the development and testing phases. Good luck Tibians, have a great fun! That was a huge project, one of the biggest in the history of Tibiabosses. Let me thank all the people involved in this project, on behalf of the author of the tool. for grammar review and spellcheck of this article.